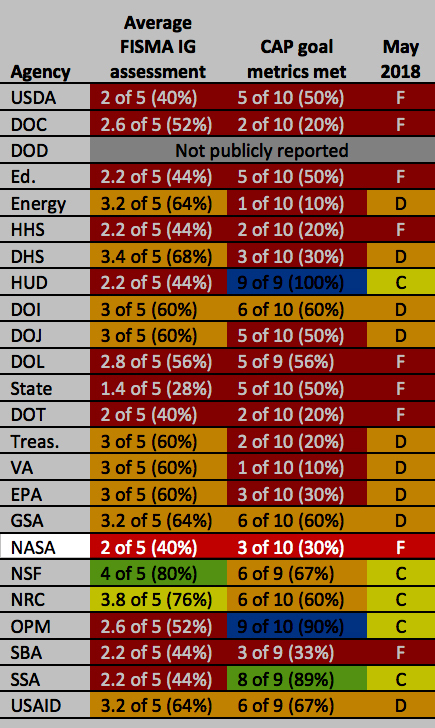 \n\n- Nov 2017 FITARA Scorecard\n\n- NASA Totally Flunks FITARA Scorecard 2 Years In A Row (2016), earlier post \n\n\"There is a slightly goofy post at NASA CIO's Open.NASA.gov (not findable on the NASA search engine) \"NASA's Approach to Implementing FITARA\" from 10 March 2016 that opens with \"My husband and I are planning a vacation to Disneyworld, an awesome destination for our five year old dreamer. How do we budget for such an grandiose trip?\", and then goes on to spout happy talk - with added IT word salad - about how seriously NASA takes FITARA. If only.\"
This page contains a single entry by Keith Cowing published on December 19, 2018 5:16 PM. CASIS Pays Big Bucks For Leadership With No Space Experience (Update) was the previous entry in this blog. A Former Employee Calls NASA About The Security Breach is the next entry in this blog.